If you love nothing more than being outside in the fresh air, hiking, running, cycling or just digging the beds over, then our pick for you is the award winning Dales Fruit Cake. It’s a hearty, golden sponge studded with currants candied mixed peel and glace cherries, warmed with a tot of rum and nutmeg spice, just the thing to keep your energy up in the great outdoors. Does you fancy yourself as a bit of a foodie? If so, why not broaden your taste horizons with a Northumbria Rice Cake? The light golden sponge has an almost al dente bite to it, thanks to the addition of ground rice to the mix. This deliciously different North Country delicacy is a taste experience no true gourmet should miss. Experience a real taste of the past with a Granny Loaf Cake. 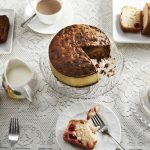 This cake is a slice of history, as it was popular during the rationing of WW2, because its an egg and fat free recipe, that relies on natural sweetness of currants, raisins and mixed peel, so it can be baked with less sugar. While it might sound frugal, this is a delicious sweet treat that has stood the test of time. Rich, dark Honey and Ale Loaf Cake fruit cake combines the bitter edge of traditional ale, with the sweetness of honey. Packed with packed with sultanas, raisins, dried apricots and cherries, this is the perfect cake to please any beer lover. You can’t beat a traditional Rich Fruit Cake when it comes to good, old fashioned flavour. This is a special occasion cake, a delicious confection of currants, sultanas, raisins, mixed peel and glace cherries, soaked in rum and fragranced with exotic spices. It’s dark, moist and indulgent – perfect with a glass of something warming or alongside a hunk of British cheese. Us Brits are addicted to tea, drinking 165 million cups per year*, so if you can’t get enough of the stuff, treat yourself to the perfect partner for a cuppa, a traditional Tea Loaf Cake. This fruit cake is infused with black tea, adding a real depth of flavour to the soft sponge studded with currants, raisins, cherries and mixed peel. If you think you have found your perfect partner, then you can order online, or browse the rest of the range to see if you can find a better match. * Figures from UK Tea & Infusions Association.